The Anchor Coral, with its green glow and gently waving tentacles, can be almost hypnotic! The Anchor Coral Euphyllia ancora is a reef keepers favorite large polyp stony (LPS) coral. It is colorful and quite attractive with its long tentacles topped with bean-like tips gently swaying in the current. It resembles its close relative, the Hammer coral Euphyllia fimbriata, but the Hammer Coral is not found around Australia. At times the Anchor Coral is inaccurately called the Hammer coral, or even the Frogspawn Coral E. divisa, but with a close look, you can correctly identify it. The Anchor Coral and the Hammer Coral are very similar except the polyps of the Hammer coral have hammer or "T" shaped tips. The Anchor corals lack the "T" shape, rather they have semi-circular or sausage shaped tips. There is also a very nice branching form of the Anchor Coral, known as the Branching Anchor Coral Euphyllia parancora. Common colors of the Anchor Coral are pale brown, green, blue-gray, and orange tentacles. These are topped with bright green, pale cream, green or tan tips that curve, looking like an elongated "C" from the top. Both the E. ancora and E. parancora can also come in shades of blue. The Anchor Coral is yet another variation of a beautiful genus of LPS that is moderately easy to keep and a great addition to any display. Like others of its genus, it will be the first to warn you that the water quality in the tank is less than acceptable. Providing it with sufficient lighting, a moderate but turbid water flow, and the availability of passing food will contribute to their success. The E. ancora has been propagated in captivity. These corals are not hermatypic, which means they do not contribute to reef structures. Yet in the wild it takes 2 years for a colony to repopulate, and there is concern about over collecting these corals. In some countries they have been outlawed for collection. Propagating these corals is very important in preserving the wild colonies. Video of Anchor or Hammer Coral and Saddleback Clown! Yet another reason to go EUPHYLLIA!!!! Not only will all the different species of Euphyllia get along, even touching each other, they will host willing clownfish! This gives the beauty of a symbiotic relationship right in your tank with the durability of a coral that looks like an anemone during the day! Feed daily with pieces of minced raw marine flesh and keep large softy populations that are noxious out of the tank, and you will be fragging your Euphyllia in no time! Distribution / Background Euphyllia Coral Information: The Anchor Coral Euphyllia ancora was described by Vernon and Pichon in 1980. Other names this coral is known for are Sausage Coral, Hammer Coral, Ridge Anchor Coral, and Wall Coral. Where Euphyllia Corals Are Found: E. ancora are found in the Indo-West Pacific in Japan and Maldives to and around Australia including the Great Barrier Reef, the Elizabeth Reef, and the North West Cape. Euphyllia Coral Habitat: The E. ancora live in colonies in waters that are turbid, yet gentle, and inhabit both reef slopes and reef bottoms. They are found at depths down to 131 feet (40 m) and enjoy indirect bright light. They have stinging cells to help capture small prey and to defend themselves against predators. Status The E. ancora is not on the IUCN Red List of Endangered Species. Description What do Euphyllia Corals look like: The Anchor Coral E. ancora has a meandering wall like structure with the polyps forming along the top, they also form "valleys" throughout the surface. They develop large colonies with polyps that retract into the skeleton, though not completely. The polyps extend during the day and only partially at night, but the skeleton is obscured unless the tentacles are contracted. The tentacles of the Anchor Coral have tips that are a sausage or "C" shape. It is similar to the Hammer Coral E. fimbriata, but the Hammer Coral has a straighter and flatter tip. The Branching Anchor Coral E. parancora is the branching form of the Anchor Coral. It has a similar size and shape as the Frogspawn Coral E. divisa, but differs in that the E. divisa has a denser skeletal structure. The colors of the tentacles can be pale brown, green, blue-gray, and orange with bright green, pale cream, green or tan tips. Both the E. ancora and E. parancora can also come in shades of blue. When feeding, the individual tentacles can elongate 2 to 3 times their normal state. Some colonies can reach over 3 feet (1 m). Lifespan is unknown. Difficulty of Care Euphyllia Coral Care: The E. ancora can be moderate to easy to care for. Provide sufficient lighting and good turbid water flow, that is neither too strong or too weak. The availability of passing food will also contribute to their success. Using trial and error, by placing coral specimens in different areas of the tank, will eventually result in locating a favorite spot. This will be evident by full polyp expansion and feeding. Foods / Feeding Euphyllia Coral Feeding: The Euphyllia corals, like other large polyp stony (LPS) corals, have developed several feeding strategies. Through a symbiotic relationship with a marine algae, known as zooxanthellae, they receive many of their nutrients. They also capture planktonic organisms, food particles from the water column, and can absorb dissolved organic matter. Aquarium Parameters A well-feed live rock/reef environment is what is needed for your Anchor Coral, along with some fish for organic matter production. A mature tank is recommended. Compatibility and Social Behaviors Euphyllia corals can be aggressive if touching other corals and should be positioned away from all other corals. The Anchor Coral is peaceful to its own genus, but will attack other genera within its family. The E. ancora's tentacles can co-mingle with E. divisa (Frogspawn) without any tissue damage. The E. ancora tend to be sensitive to aquariums that have large collections of soft corals, specifically, some Sinularia species. When hungry, their sweeper tentacles can reach over 10" (25 cm) in large colonies, which poses a threat to nearby corals due to their strong sting. Feeding them regularly will help alleviate this problem. Euphyllia genus reproduce asexually as well. In captivity, the E. ancora will bud off small groups of polyps with little skeletons attached. They will also pinch off their own tentacles, which then floats off, and being sticky, will reattach and start a new colony. Potential Problems The Euphyllia spp. are fairly hardy, but are susceptible to a few maladies. The E. ancora is susceptible to brown jelly or protozoan infections, collection problems, and intense lighting. Do not place directly under Metal Halide, or the E. ancora's polyps can be damaged and can lead to rapid tissue necrosis or RTN. 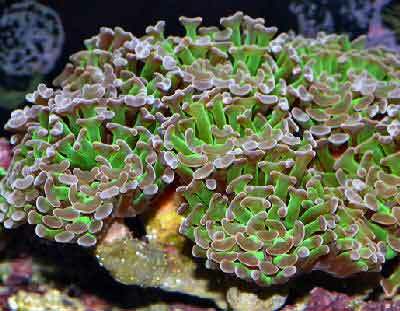 Availability Euphyllia Corals for Sale: The Anchor Coral E. ancora is very easy to find at pet shops and on line. Online they can run about $39.00 USD or more depending on size and/or color.